Koogeek Smart LED Light Bulb is a Wi-Fi enabled LED light bulb that works with Apple HomeKit, and compatible with Alexa and the Google Assistant. It uses only 8 watts and delivers up to 500 lumens of light with a color temperature from 2700K to 6000K. Offer 16 million colors to choose from. After screwing in your Smart Light Bulb, and configuring it from the Koogeek Home app over a 2.4GHz Wi-Fi network, you can remotely turn smart light bulbs on or off, change colors, and dim brightness by using the Koogeek Home app or just asking Siri. You can even use your Amazon Echo or Google Home to control the connected light bulbs by just asking Alexa or the Google Assistant. For iPhone, iPad, iPod touch only: you can set timers, control multiple HomeKit-enabled accessories simultaneously and automate your accessories. Setup only takes a few minutes, no hub required. When configuring, screw it into a standard E26 light socket and use the Koogeek Home app to connect it to a 2.4GHz Wi-Fi network. 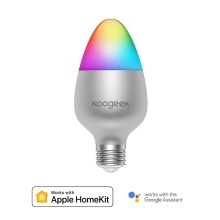 You can remotely turn connected light bulbs on or off, change colors, or adjust brightness using the Koogeek Home app, Siri, Alexa, or the Google Assistant. * Note: If Alexa or the Google Assistant connection is not configured, controlling HomeKit-enabled accessories from your iOS devices over your cellular networks or other Wi-Fi networks requires your HomePod, Apple TV 4K, Apple TV, or iPad set up as a home hub. After successfully configuring Alexa or connecting to the Google Assistant, the ON/OFF status, colors, and brightness of connected light bulbs are synced and shared across iOS devices and Android devices. Create scenes and control multiple HomeKit-enabled light bulbs with different light colors and brightness at the same time. Turn a scene on or off by tapping it, setting a timer or just asking Siri. (3) automate connected light bulbs or scenes to turn on or off through triggers such as time of day, location, HomeKit-enabled sensor detection, or the action of a HomeKit accessory. – To control this HomeKit-enabled accessory with your iPhone, iPod touch, iPad or Apple Watch, iOS 9.0 or later is recommended. – To set up automations and user permissions for this HomeKit-enabled accessory with your iOS device requires a HomePod, an Apple TV 4K or Apple TV (4th generation or later) with tvOS 10.1 or later, or an iPad with iOS 10.1 or later set up as a home hub. – To control this product with your Android device, Android 4.3 or later is recommended. – To control this product with Alexa using your voice, an Alexa product is required. – To control this product with the Google Assistant using your voice, Android 6.0 or later, or iOS 9.1 or later is required.